Bland space? Introduce colour and pattern to create visual interest. A large geometric print rug is just the trick. If you can’t find the right rug you can also look at patterned artwork, or patterned cushions. Its good to have one eye catching element in the room to make your property standout. Moroccan patterns are so hot right now! A common trick used in the styling trade is one bold bright statement chair that can make any room pop. Matt Blatt and Interiors Online all have affordable options that can make any room feel stylish and edgy. Repeat the chosen colour with artwork and accent cushions for a tailored scheme. and Bunnings Warehouse both have very reasonable yet stylish options. By swapping out outdated oyster lights to pendants lights – a room instantly feels modernised. The larger scale the more impact. A big trend right now is the industrial style pendants in copper, black or chrome. Mix and match throughout the property for an eclectic and edgy look. 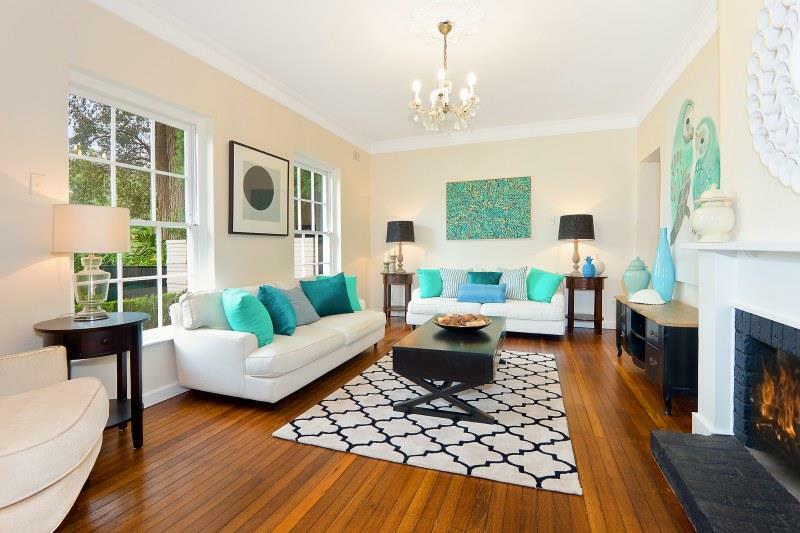 For more information on home styling in Sydney.